Jet / Brella, Inc. offers Airbus jet engine inlet covers to protect your private jet against foreign object damage while your aircraft is parked on the ramp. Please select your Airbus aircraft model above to view our inlet cover spec sheets. Airbus models include A318, A319, A320, A321, A340, and A350 XWB. 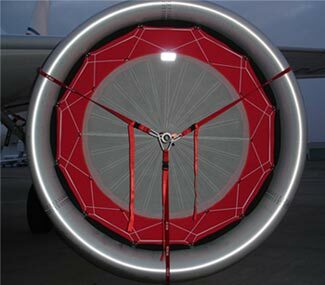 We also offer custom designs and logos for your Airbus aircraft for our Jet / Brella inlet covers. Custom inlet covers are made for the ACJ jet engines and other engines if a custom application is needed.